Rye flour, hydrogenated wheat sour dough, dehydrated vegetable oil (palm- or rapeseed), barley malt flour, wholemeal wheat flour, lecithin E322, guar gum flour E412, corn flour, citric acid E330, sodium acetate E262, dextrose, wheat malt flour, lupine flour, calcium sulphate E516, ascorbic acid E300, enzyme (vegetable origin). 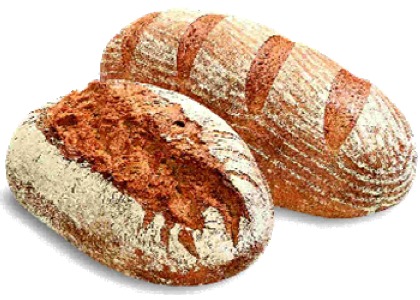 • German type rye flour, plus all necessary ingredients to produce best quality rye bread. Contains no salt, therefore variable dosage from 20 – 50 %.